Metallics. Are they back? Did they ever really leave? In the past few years I’ve seen the trend of “matte everything” come and go, and some people still stuck with metallics when it felt like I was living in a world of matte lipstick, eye shadows, skin, the whole shebang. That leaves us mere makeup enthusiasts sitting there thinking… Well now what? For me, I didn’t get super into makeup until around the time matte everything was on the up-and-up. So I learned most of my makeup tips and tricks under the assumption that I’m working with mattes. Thank goodness Urban Decay didn’t let me down and included metallics in their palettes despite the fact that no one used them… ever. I remember buying my first high end eye shadow palette (Urban Decay’s Naked Smoky) irresponsibly after getting my financial aid refund for school. I remember distinctly looking at the metallics and thinking, Wow, when will I ever use those? With a little practice, I was able to incorporate metallics back into my makeup routine, and after spending too much time staring at the Not Your Counter Culture’s Pinterest board (here) for metallics, I decided to give you a daytime metallic look that pretty much anyone can do if you’ve been doing makeup for any length of time. 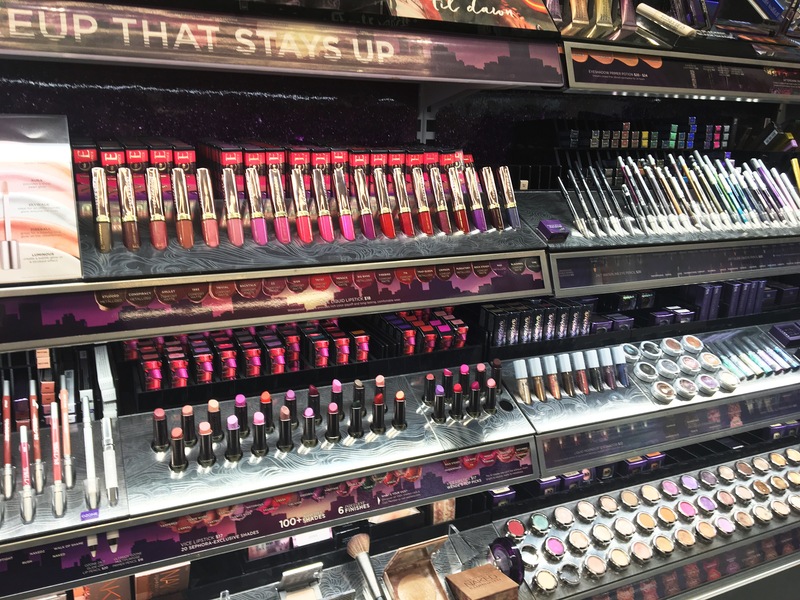 For the look I’ve outlined in this piece, I’ve compiled a list of dupes for all the colors because I have a problem and splurge on high-end makeup when I know first hand that drugstore makeup can sometimes work just as well. I’ve compiled a daytime look and a nighttime look with the hopes that they can help you figure out how to work with metallics and even better, how to make metallics work for you. I have a pink undertone, pink is also my favorite color, so; I use a lot of pinks in the daytime look, I didn’t realize until it was on my face that it might not work for everyone. My partner who has golden undertones absolutely adores working with gold metallics and reds. The general formula for metallics is the same, however. Blend until you can’t blend anymore. So let’s get into the nitty gritty of it all, shall we? For this look, I did a “full face” of makeup, but if you’re an eye shadow, mascara, highlight person like I usually am? Go for it. Use as little or as much of this look as you’d like. First, I didn’t include a concealer in this because I hate the one I’m using right now. I don’t want to subject you to it, so I’m leaving it out. I’m still using concealer however. So, do whatever you normally would do with that, remember this is a daytime look so I’m a little more free flowing with face makeup. Just do whatever you would normally do in terms of priming, concealing, and foundation. So there you are, a blank slate, ready to go. For this look, I use a, as I’ve dubbed it, ‘Lazy Girl Contour.’ See, I don’t like spending 3 hours on my face, so I’ve gotten pretty good at using my time as efficiently as possible. Thus, the lazy girl contour is born. What I do is I bake under where I would normally contour so over the jaw and just under the hallows of my cheeks. While that’s doing it’s thing, I combine the bronzer from my Smashbox Step-By-Step Contour Palette with one of the bronzing highlights from my Sephora illuminate palette and apply that right above where I’m baking, starting back by my hairline/ear area and brushing forward not going past about 1/3rd of the way down the line that I’m baking in. Then, taking my blush, I start up by my temple and brush downwards over the tops of my cheekbones and the apples of my cheeks. Now, you might be looking at your cheeks thinking, “Alix… I look like a botched container of Neapolitan ice cream.” Worry not, hopefully by now you’ve baked long enough. So, blend your face until you look like a glowing god/goddess. Lastly, taking a large fluffy brush, apply the highlight of your choice from your temple down over the tops of your cheekbones in a nice little swoosh. Also apply to your cupid’s bow and tip of your nose. Fill out your brows as you normally would, apply some highlight under the arch of your brow for an additional metallic pop. Apply the Urban Decay Eye Primer Potion in Minor Sin, I recently bought this because the Naked 3 Palette comes with tester samples of a bunch of their primer potions and I was hooked. I love Minor Sin because it already gives you some sparkle before you get going with the eye shadow. Starting with a fluffy brush and took Limit and brushed it from my lid to my brow bone. Next, I took Tea Party and applied it to my lid with my finger, it’s mousse so it’s really easy to apply with your finger, I don’t recommend trying to use a brush. You won’t get a lot of product on your lid and it isn’t very pigmented that way. After I put Shark Attack on my outer crease and blended it with a blending brush upwards as well as with Tea Party. Using Cobbler, I applied it to the inner corner and blended it along my crease to build up some depth. If it still looks a little patchy blend it with a fluffy brush with a little bit of Limit. Do your favorite wing with an eyeliner of your choice. I used a drugstore liquid eyeliner because I’m trying to use as many drugstore brands as I can for particular looks. Mascara on the upper and lower lashes and bam! Metallic eyes! When I did this look and wore it out, I got the most complements on the lipstick! So for the lips, I applied Blistex while I was putting on my face makeup so I could moisturizes beforehand. Keep a look out for a possible article about lip-care while wearing liquid lipstick because that is important. Anyway, I put Kat Von D’s Berlin on, for this don’t worry about getting every single inch of your lips because you’re going to go over it with the Romance later. When it is about 80% dry, apply the Romance over it. This is where you want to make sure that you’re filling in your lips and smoothing all your edges. If you do this with Berlin, it will look like you lined your lips with hot pink lip-liner. Don’t put Romance over you lip line and then it just falls apart, so do be careful. Finally, once your lips are 100% dry either using your finger or a lip brush, apply Just Peachy all over your lips for a bold metallic glow. And there you go! This is a fantastic look for a day date or just wanting to look extra snazzy! Now you’re so shiny you’ll be as easy to find as a nightlight in a dark room! I try to make my color choices as accessible as possible so I’ve included dupes for as many colors as I could find in hopes that you can recreate this look without breaking the bank! All of the following dupes are cheaper than the original product. Allie, or Alix to some, is a femme healer, a witch, and a begrudging academic from California. She has an affinity for lipstick and skin care, as well as spending obscene amounts of money on eye shadow palettes. Her passions include witchcraft, queer justice, radical vulnerability, and maintaining her mental health. She enjoys blogging about gender+ sexuality, makeup, mental health, and music. Overall lives her life embracing the hashtag #Femme4Femme.